LANSING, Mich. — State Sen. Ken Horn, R-Frankenmuth, welcomed the players and coaching staff of the Flushing High School girls basketball team to the Michigan Capitol on Thursday to recognize their recent Class A state championship title, the first for the district since the girls golf team won in 1977. 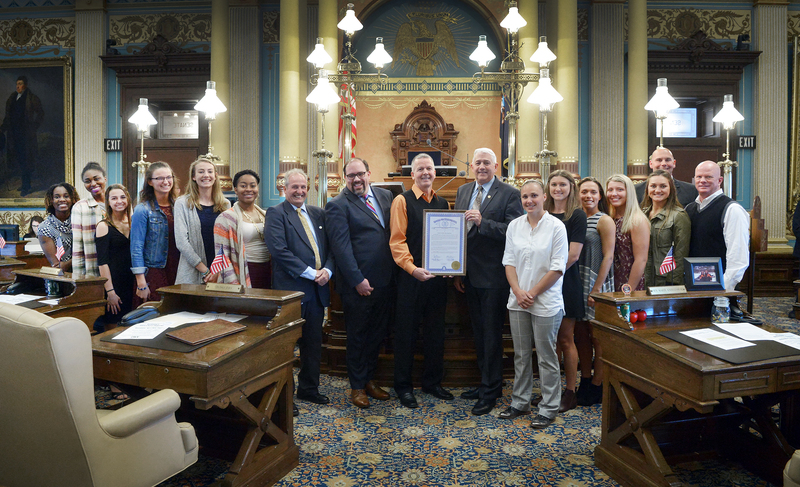 Horn was joined on the Senate floor by players, Head Coach Larry Ford, Assistant Coach Dave Pratt, Athletic Director Paul Brieger and Junior Varsity Coach Courtney Walters, as he presented them with a special tribute honoring their accomplishment. Ford, who is in his 13th season as the head coach of the lady Raiders, was also named this year’s MLive-Flint Journal coach of the year. Editor’s note: Print-quality photographs of Horn welcoming Thursday’s guests are available by clicking on the images or by visiting the senator’s website at: www.SenatorKenHorn.com. Click on “Photowire” under the Media Center tab. Video of Horn welcoming the lady Raiders is also available on his website by selecting “Video” under the Media Center tab. LEFT PHOTO CAPTION: State Sen. Ken Horn, R-Frankenmuth, stands at the Senate rostrum with Coach Larry Ford (center), Athletic Director Paul Brieger (back left), Assistant Coach Dave Pratt (back center) and Junior Varsity Coach Courtney Walters (back right) as the Flushing Raiders were recognized for their recent Class A state championship on the Senate floor Thursday. 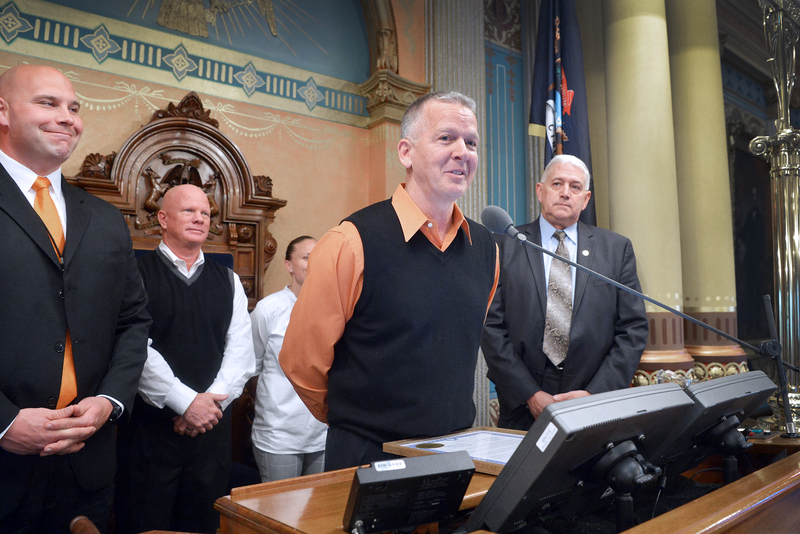 RIGHT PHOTO CAPTION: State Sen. Ken Horn, R-Frankenmuth, is joined by Rep. Joe Graves, R-Argentine Township, and Senate Minority Leader Jim Ananich, R-Flint, for a photo on the Senate floor Thursday with the Flushing High School girls basketball team and coaching staff. The lady Raiders were at the Capitol on Thursday to honor their recent Class A state championship.